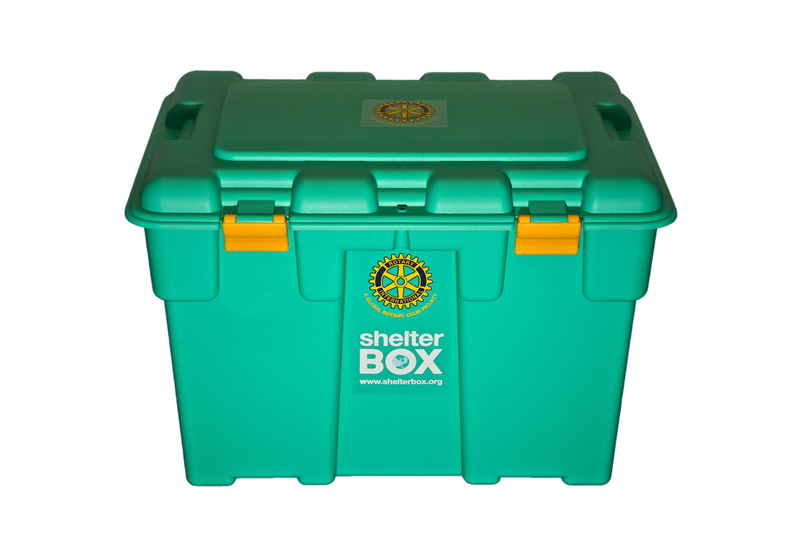 Through fund raising efforts by the International Committees of the Rotary Club of Essex, Chester Rotary, and Deep River Rotary, we raise money to fund Shelterboxes. The ShelterBox solution in disaster response is as simple as it is effective. We deliver the essentials a family needs to survive in the immediate aftermath of a disaster. Each green ShelterBox is tailored to a disaster but typically contains a disaster relief tent for an extended family, blankets, water storage and purification equipment, cooking utensils, a stove, a basic tool kit, a children’s activity pack and other vital items. The standard ShelterBox weighs 120 lbs. and has approximate dimensions of 33″ x 24″ x 22″. They are sealed and banded for transit and security. Box contents vary depending on the nature of the disaster requiring their use. Materials are ordered from a range of suppliers selected for general use, long-life, quality and price. ShelterBoxes are prepared and packed using all new materials as delivered from manufacturers, at the ShelterBox international warehouse based in Helston, Cornwall. At the heart of every ShelterBox is a disaster relief tent for an extended family. It is custom made for ShelterBox by Vango, one of the world’s leading tent manufacturers, and is designed to withstand extreme temperatures, high winds and heavy rainfall. Internally, each tent has privacy partitions that allow recipients to divide the space as they see fit. In addition to the tent, there is a range of other survival equipment including thermal blankets and insulated ground sheets, essential in areas where temperatures plummet at nightfall. Where malaria is prevalent, mosquito nets are supplied, as well as life-saving means of water purification. Water supplies often become contaminated after a major disaster, as infrastructure and sanitation systems are destroyed. This presents a secondary but no less dangerous threat to survivors than the initial disaster itself. Our water purification equipment, the LifeStraw pictured below, can provide a typical family up to three years worth of clean and safe water. A basic tool kit containing a hammer, axe, saw, trenching shovel, hoe head, pliers and wire cutters enables survivors to improve their immediate environment by chopping firewood or digging a latrine, for example, then when it is possible, to start repairing or rebuilding the home they were forced to leave. Every item is durable, practical and brand new. The box itself is lightweight and waterproof and has been used for a variety of purposes in the past – from water and food storage containers to a cot for a newborn baby. Key items are either a wood burning or multi-fuel stove. The multi-fuel stove can burn anything from diesel to old paint. Some boxes also contain our specially designed wood burning Frontier Stove, pictured below. This provides the heart of the new home where water is boiled, food is cooked, and families congregate. In addition, there are pans, utensils, bowls, mugs and water storage containers. A children’s pack containing drawing books, crayons and other supplies. For children who have lost most if not all their possessions, these small gifts are treasured. We keep a broad range of equipment in stock so we can adapt the contents of a box to a specific disaster. For example, following the Javanese earthquake in 2006, when some resources were available locally or could be salvaged from buildings, the overwhelming need was for shelter – so we just sent tents, packing two in each box.